Almost all of my yoga practice has been at home. I would love to take more in studio classes, but sadly it never fit with my work schedule when I could afford it and now that I have free time I have less money. Last year for Christmas I signed up for an 8 week beginners Ashtanga program and LOVED it. So this year I bought myself a pack of class passes. Yesterday I signed up for my first class of the year: Beyond Beginners. I thought it would be a nice transition back into a led practice. I was insanely nervous on my way there. What if I can’t keep up? What if I’ve forgotten all of it? Will I like the teacher? I freaked myself out over nothing. In fact, the class was far too easy for me. It seemed more Before Beginning than for someone who would have taken one of their beginner’s programs. While it was relaxing, we only focused on a few poses. At first I was disappointed but after thinking about it more, it was perfect. Now I feel more confident to jump into a led ashtanga class. 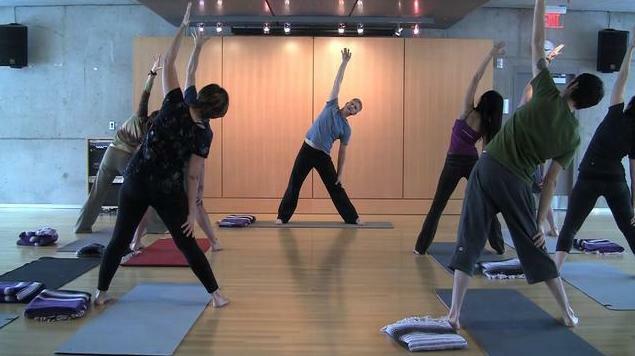 Does your gym have any yoga classes you could take there? @ Stacey H : Nope 😦 We go to Cardinal Fitness. They are super affordable and have great equipement… but no classes of any kind. So glad I could give a smile! I would love to visit Kripalu! I’m hoping to plan more yoga trips once I get a full time job.